International dividend-paying companies can be a great way to gain diversification and potentially benefit from economic growth in faster-growing emerging economies. Unfortunately, like with U.S. dividend stocks, the governments of the world will want their cut in terms of taxes. And just as with U.S. dividend tax law, the fine details of how much you have to pay and what forms you need to fill out can be both time consuming and a source of much angst come tax time. Let’s take a look at foreign dividend withholding taxes as it applies to U.S. income investors to see what you need to know to invest responsibly in international dividend stocks. What are Foreign Dividend Withholding Taxes? While the U.S. government does tax dividends paid by American companies, it doesn’t impose tax withholdings. In other words, each investor receives the full dividend amount and is responsible for reporting their annual dividends to the IRS each year and paying taxes accordingly. However, many foreign governments automatically withhold taxes on dividends paid by companies incorporated within their borders. For most taxable accounts this means that a certain percentage of your dividend will be withheld by your broker. Unfortunately this also means that the effective yield you receive is often less than that quoted on popular financial sites such as Yahoo Finance and Google Finance. The amount withheld in taxes varies wildly by nation. As you can see, some nations are far friendlier to foreign dividend investors than others. Meanwhile, some of the most popular foreign dividend companies, including those in Australia, Canada, and Europe, can have very high withholding rates, between 25% and 35%. Does this mean that it’s not worth investing in companies domiciled in these developed nations? Not necessarily. Thanks to various tax treaties between the U.S. and various countries around the world, the actual amount U.S. investors need to pay can be much less than this headline figures. In order to avoid double taxation, in which dividend investors are taxed by both foreign governments and the IRS, the U.S. has worked out tax treaties with over 60 nations. For example, the tax treaty between Canada and the U.S. means that most Canadian qualified dividends only face a withholding tax rate of 15%. Better yet? Canada won’t withhold any dividend taxes on shares held within a tax-deferred account such as an IRA, Roth IRA, or 401K. Best of all, because of something called the foreign tax credit U.S. investors can usually write off these smaller withholding amounts in their entirety. In other words, the 15% you end up paying the Canadian government in taxes will reduce, dollar for dollar, the 0%, 15%, or 20% (based on your U.S. marginal income tax bracket) that you would need to pay the IRS. Of course there is a downside to these tax treaties, namely that each one is different, meaning that minimizing your international tax burden can get very complex. For example, Switzerland is tied with Chile for the highest withholding rate in the world, 35%. The U.S. tax treaty with the Swiss means that U.S. investors should only face a 15% withholding rate. However, in order to obtain that 15% withholding rate you, your broker, or asset manager, need to file separate paperwork ahead of time with the Swiss government. If you don’t than the full 35% amount will be withheld, and the IRS will only allow you to write off 15% from your tax burden. This added complexity is why, according to GlobeTax, a New York–based firm that specializes in international tax recovery, many Americans end up paying more in foreign taxes on their dividends than they should, to the tune of $200 billion a year. That’s because very few brokers (such as JPMorgan and Morgan Stanley) will automatically fill out the complex paperwork on behalf of investors. Most brokers, such as Fidelity and Vanguard, use global custodian institutions, which are the ones that keep track of your how many shares you own and are responsible for making sure you receive your dividends. Due to the complexity involved with minimizing an investor’s tax burden, few of these custodians will voluntarily fill out these forms for you. Of course, a high-quality asset manager will; however, they generally charge high fees and will only accept large client accounts, meaning at least several million dollars. Thus the small retail investor is generally on their own when it comes to obtaining these foreign tax credits. There are two ways to make sure you aren’t overpaying your foreign taxes: a foreign tax credit, or deduction. You need to make the decision about which to use for all of your foreign withholdings in any given year. In other words, if you want to take a credit for some of your withholdings, than you need to take a credit for all of it, and vice versa. What’s the difference between the two? So obviously the tax credit is the preferred choice, because it saves you more money. The simplest way to obtain this credit is if your global foreign tax withholdings are $300 / $600 or less per individual or couple filing jointly, and you have received a 1099-DIV or 1099-INT form from your broker outlining your total foreign tax withholdings. That’s because you can then deduct the full tax credit, dollar for dollar, from your total U.S. tax burden, thus usually fully recouping foreign dividend withholdings. However, the catch is that you can only deduct an amount equal to your total U.S. tax liability in any given year. For example, say your total U.S. tax liability is $10,000 but you had $15,000 in foreign tax withholdings. In that case, rather than sending you a $5,000 check, the IRS will only let you subtract $10,000 for that year (you owe nothing), and then rollover $5,000 in tax liability reduction into future years, limited to a decade. Another benefit of this credit is that you can use it in conjunction with your standard deduction ($12,000 for single filers; $24,000 for joint filers), which the majority of Americans take rather than itemizing. In other words, as long as your foreign withholdings aren’t too large, you can use the standard form 1040 to do your taxes. What if your foreign tax withholdings are above the $300 / $600 level for individuals and couples filing jointly? Well, that’s where things get even more complex. In order to determine how much of a tax credit you can claim above the $300/$600 limit you need to fill out form 1116, which gets attached to your form 1040 and has instructions that are 24 pages long. Why do you have to jump through these extra hoops? 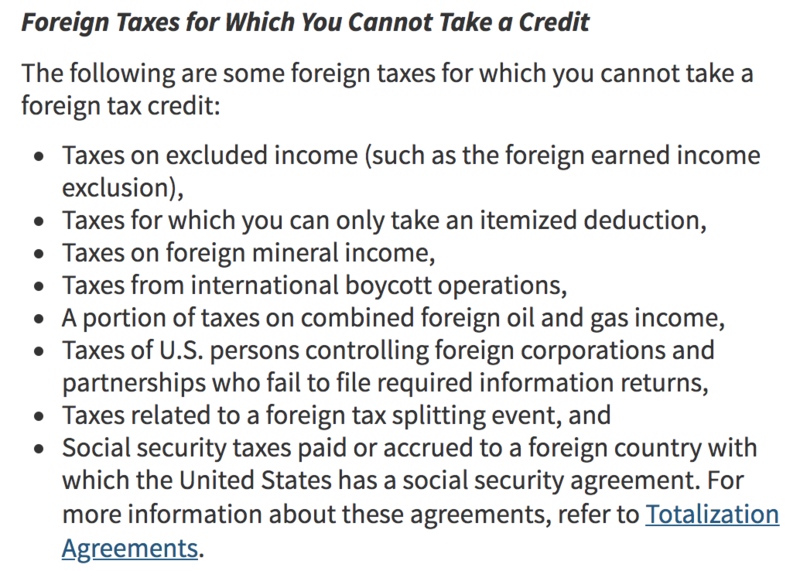 Why can’t you merely obtain a full foreign tax credit for the amount of your foreign withholdings? Because not all foreign dividends qualify for that preferential treatment. Fortunately, many of these exclusions don’t apply to most investors, other than the potential for Puerto Rican stocks, whose dividends aren’t qualified for a credit and must be itemized for a deduction. However, there is one kind of tax credit disqualification that can affect regular investors that you need to be aware of and is the reason why anyone with over $300/$600 in foreign withholdings must fill out form 1116. Any withheld dividends on stocks or preferred stocks that you held for less than 16 and 46 days, respectively, before the ex-dividend date are considered unqualified dividends that will decrease the total amount of foreign tax credit you can claim. What about Foreign Dividend Withholding Tax in IRAs and 401Ks? Given the complexity of foreign withholding taxes, many investors might think that owning these shares in a tax-deferred account might be a good way of avoiding the paperwork hassle. However, that’s not usually the case. That’s because, with the exception of Canada, which doesn’t withhold dividend taxes in shares owned in such accounts, most nations do. And because of the tax sheltered status of IRAs and 401Ks, the IRS doesn’t allow you to take any credits or deductions for foreign withholdings for these accounts. In other words, you could be facing the loss of up to 35% of your dividends, with no beneficial U.S. tax liability offset. Which means that for tax sheltered accounts you want to make sure to only own Canadian stocks, or those domiciled in nations that have 0% withholding rates such as the U.K. (except for U.K. REITs which face a 20% withholding rate). Owning foreign dividend growth stocks can provide some benefits for building a diversified portfolio, but larger investors (those who face foreign withholdings above the $300/$600 limit) will certainly want to do research and be careful about which companies they buy. I personally prefer to invest in U.S. multinationals to gain exposure to faster-growing international markets and avoid many of the accounting and tax headaches that can come from investing in foreign companies directly.